RUSH: One more, our old buddy Nic Robertson. Anytime we get a sound bite from Nic Robertson, I have to air it. Nic Robertson is a CNN reporter, international correspondent. A favorite Nic Robertson bite was during the Arab Spring when Egyptians were rioting. 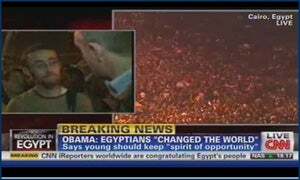 Obama was over here trying to claim credit for it, that the Egyptians had seen the Obama campaign and Egyptians were demanding, because of the inspiration from Obama, similar changes in Egypt. So if Obama thought that, so did CNN. And you watch this in incredulity because there had been no support of Barack Obama. The people in Egypt didn’t even factor him into what they were doing. But our old buddy Nic Robertson, it wasn’t even about Egypt. It wasn’t even about the people of Egypt fighting oppression or whatever. It was the Egyptians being inspired by Obama. It was such phoniness. RUSH: Let me go back into the phones. It’s Open Line Friday. And we try to take quite a few on Friday. And it’s been a while since we had one. We’re going to go to Los Angeles. Peter, great to have you. I really appreciate your patience. How are you doing? CALLER: Good, Rush, how are you? RUSH: Fine and dandy, thank you. CALLER: Good. Good. I wanted to make a comment on the North Korea situation. My wife and my two daughters, who are college-aged kids, are in Korea right now. And I spoke to them the other day, I said, “Is there a lot of coverage on what’s going on with Kim Jong-un?” And they’re like, “Dad, there’s no coverage. It’s not even widely covered.” The perception that this guy’s going to attack is so false, Rush. He is living the life of luxury and he is not going to be attacking anybody to jeopardize his life or his family’s life or the people around him. He’s doing this because he needs to show his people, basically rally his people around him. But one other thing, Rush. CALLER: What I think Trump should do, and I think this would be the best thing that Trump ever did, is I think he should use this opportunity and use North Korea as an excuse to build up an arsenal of nuclear missiles pointed at the ChiComs, because I think that’s the biggest threat to us, is the Chinese. And since we have these allies, I think what we should do is build up nuclear missile bases in South Korea, in Japan, and in the Philippines, and start pointing them at China and let’s see how they react. RUSH: That’s a fascinating state craft theory. And I’m not going to even attempt to react to that inside of 25 seconds. Let me process that and I’ll get back to you on that. Maybe not on today’s program, but I’ll make a reminder here with Siri and that way I won’t forget it. I got a whole bunch of thoughts running through my head here. Not enough time to mention what they are. But I appreciate the call. I do. RUSH: If you’ll indulge me, and for those new to the program have not heard this, you’ve got to hear these Nic Robertson sound bites before we get to the one with Nic talking about Trump and Kim Jong-un and what he thinks of Trump. This is back in 2011, during the Arab Spring. 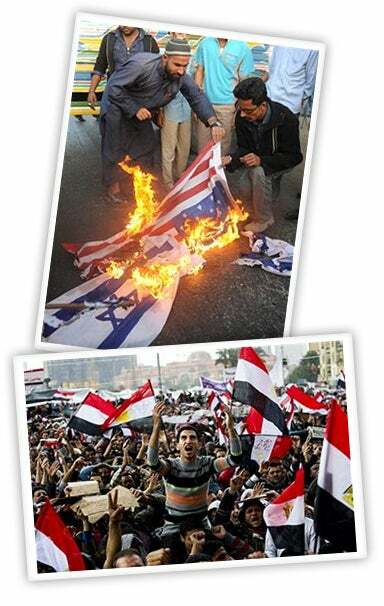 This is right after Obama’s big Cairo speech. 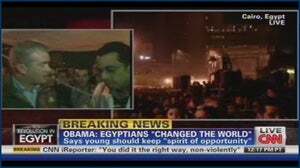 The Arab Spring is beginning as a protest against Mubarak all over Egypt, and Obama is literally trying to take credit for it in speeches and public statement, saying that his campaign inspired this move to freedom in Egypt. ROBERTSON: Achmed, you’ve been here, down here on the Square for many days. The United States and the international community… You’ve just listened to President Obama saying that America will support Egypt if it wants help and assistance, and hopes that there will be a good transition for jobs for the young people. What would be your message for President Obama? RUSH: (laughing) Stop and think of the arrogance of the question. Here the people of Egypt are in an uprising for whatever. They think it’s their freedom. And CNN sends a guy over there to make the story about Obama! “What would be your message for President Obama as he asks for jobs for the people?” It was just… Folks, it was just too classic and it was infuriating, laughingly infuriating. It was sickening, so predictable. So Nic bombs out there with, with Achmed, and so now it’s time to move on to Mustapha. RUSH: (laughing) Okay, so he’s 0-for-2. “What’s your message for President Obama?” “Well, we started this without any outside help. He didn’t do diddly squat, and he’s not even on our minds here.” So now Nic, sticking with Mustafa, not giving up, giving it one more old college try. RUSH: (laughing) “Actually Obama’s views have kind of conflicted. No, Nic, we’re actually not pleased that Obama has come out and supporting change for Egypt.” So, it’s time for the wrap-up now. It’s time for Nic Robertson at CNN to tell the CNN audience what they just saw. ROBERTSON: Come the Arab Spring 2011, and this is after Moammar Khadafy has decided to give up his nuclear weapons, to be rehabilitated into the international community. When I was talking to his son and his advisors, they could not believe that the West would go against Moammar Khadafy because they thought they had trust because they thought they had done what the West wanted. So, if you’re Kim right now sitting there looking at Khadafy’s experience, you have to be thinking, “How am I going to trust the West? Khadafy did what they wanted; he handed over his weapons program after he was trusted. You know, he was killed by his own people!” That has to be going through Kim’s mind as well. So the Khadafy experience i-i-is not one that’s going to work well in Kim’s mind for coming to the table to talk. RUSH: Let me translate this for you. Nic Robertson is trying to tell you that Kim Jong-un would not be so stupid as to do a deal with Trump, because he sees what happened to Khadafy. Khadafy was killed by his own people — Khadafy after cooperating with who, folks? That would be Hillary. Khadafy after cooperating with Hillary was gunned down, mowed down, and Hillary moves in, takes over the country, and starts bragging about it. And Nic is saying he wouldn’t be that stupid. Essentially, what Nic Robertson is saying is: “The United States cannot be trusted, and Kim Jong-un — young, aspiring dictator of the poor people of North Korea — understands this. Kim Jong-un understands the United States can’t be trusted because of what he knows they did to Khadafy and he will therefore never ever make a deal and he shouldn’t.” It’s more of the same sickness of the United States of America media siding with a murderous genocidal young dictator over its own president — in this case, Donald Trump — so poisoned by hatred are these people. Now that takes me back to our last caller’s question. He’s got a couple of kids, students, in South Korea. No coverage, whatsoever, ladies and gentlemen, of this rabble rousing that’s going on. His theory is this Kim Jong-un in his own personal life is living large. He’s living well. And there’s no way he’s going to do anything to interrupt the flow of Scotch and tequila and whatever else he’s got coming his way. He’s not going to do anything to interrupt all of the creature comforts that he has. He’s just huffing and puffing because he wants to impress people or his own people or what have you, and that is a prevailing opinion. How did this get started? I need to ask you again how this got started. I know, look, Kim’s been launching his little podunks. They haven’t hit anything. And he’s talking big. And he’s saying Guam’s in our crosshairs. What really got this started, a Washington Post piece on Tuesday, which was a lying sack of excrement story that we just learned that Kim Jong-un had succeeded in miniaturizing 60 nuclear warheads for his missiles. And in fact that story is months old. It’s more than months old. The story is four years old, and it dates back to the Obama administration. All of this happened during the Obama Administration, where there wasn’t one news story expressing concern, alarm, fear, while this little dictator is ramping up. While he’s miniaturizing his warheads so they’ll fit inside their missiles, it’s all happening with the assistance of the Obama state department, there’s not a single story of concern. It’s a four-year-old news story that the Post runs as breaking news on Tuesday morning. It creates this air of inevitability that little Kim is going to launch, and it’s where we are. I’ll tell you, all of this is just irresponsible. Now, as to the frame of mind, I think it’s a mistake, always a mistake to apply, like what our last caller did, we consider ourselves to be rational people. So we assume or we are inclined to analyze others with the same rationality. And this guy isn’t. We cannot transfer or project our own rationality and world view to something like this. He can’t possibly have the same world view we do. He can’t possibly have the same concerns we do. He’s got an entirely different — We don’t even know if he’s mentally stable and all there. But according to our media he is. In fact, according to Madeline Albright or Susan Rice, he’s very wise. He’s not crazy. Trump is the crazy one. Right? Trump is the wild card. Trump is the guy we’re worried is going to be sleep walking trying to punch a button. And this guy, to the extent, folks, our people here are on edge and provoked into being this way, it’s the media is doing this. The North Koreans are behaving no differently than they always have. This guy and his father and grandfather; they’ve always launched missiles trying to be tough guys. Have we dealt with the Russians and their nukes? Oh, give me a break. The Soviets threatened us each and every day with it. The Soviets were expanding all over. Define, deal with it. You mean take them out, stop them, prevent them? Who else that has nuclear weapons have we stopped and prevented? Zilch, zero, nobody. All we’ve done since Obama is expand the nuclear club. We have these faux arms reduction treaties, seminars, summits and so forth, but those are irrelevant. Once you have an arsenal that can take out your enemy, it doesn’t matter how many times you do it because it only takes one launch. The parity in this kind of stuff, it became a phony negotiating point anyway. Why do we have to deal with it? Who says we have to deal with it at some point? We only have to deal with it if the guy launches. And if we think this guy is unstable, he’s going to launch, then, yeah, we deal with it. Do we think the Pakistanis are going to launch? If we do, we have to deal with it. If we think Russians, Putin is, we’ve got to deal with it. I know nobody in India or Pakistan is threatening to launch, but they’ve got the capability. And in Pakistan you wouldn’t describe it as stable. And what happens if al-Qaeda or ISIS gets their hands on some of this stuff, miniaturizes it in a suitcase? That still remains a huge threat.